Knoe Studios LLC is owned and operated by Victor and Emily Knoe. Victor and Emily are Christians, and Knoe Studios is run according to their faith. They ensure that their projects are family-friendly and appropriate. Read more about them below. First, we grow artists. We seek to create family-friendly opportunities for art and creativity, to expose all individuals to art, both children and adults. We do this through offering art and craft parties and tutoring. See our services below. Secondly, we help artists grow. We seek to provide opportunities for artists to instruct, to write, and to further their reach. We would love to create a maker space in Oviedo, FL or nearby. We envision a property capable of individual workspaces, shared workspaces, and space for classes. We envision recurring art and craft fairs, as well as master classes. If you share our vision and would like to help towards this community goal, please let us know! We offer unique art and craft classes. Our class instructors are professional artists with real-world experience. The instructors design the paintings and projects specifically around certain artistic skills and techniques. We offer tutoring and we can work with home-school groups to incorporate the curriculum themes. 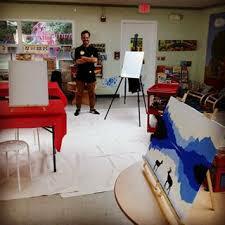 You can book Knoe Studios to teach a creative class party at your home, business, or event room. Please message us with the type of party (child’s birthday, baby shower, etc.) as well as the type of project you’d like or the theme of the party. We partner with churches and non-profits to create unique art-party fundraisers. Please message us if you’d like to discuss a fundraiser for a good cause. Victor and Emily Knoe have worked in many mediums, from painting to sculpting, woodwork to sewing, even fiberglass and mold-making! Please message us to discuss the possibilities of your project. See our portfolio for past work. Emily Knoe has worked in many mediums, and enjoys multi-media the most. She is the co-owner of Knoe Studios LLC with her husband, Victor Knoe. She began her first art-related business, called Chimera Artworks, while still in high school. During this time, she was dual-enrolled in high school and community college, seeking an AA in Business Management. Emily studied drafting for four years during high school, through a unique program offered by the school. She also began to study photography in high school, switching to the college courses at the community college when she exhausted the offerings at the high school. She received her AA in Business Management in 2004. After spending some time, climbing the business ladder in many different industries (retail management, the financial industry, even pest control!) she returned to school to seek her BA in Art Education at the University of Central Florida in spring of 2007. Emily and Victor met at UCF and married, after Victor graduated, in 2011. While still working full time, Emily was able to accumulate 126 credit hours towards the degree in Art Education (lacking very few courses) before needing to take medical leave in 2013. She hopes to return to school soon to finish her degree. In November of 2013, Emily and Victor welcomed their baby girl, Ramona, into the world. Through her diverse background, Emily’s experiential reservoir feeds into her artistic ability. She often uses alternative techniques and methods to create her art. Victor Knoe is Puerto Rican and has lived in both Texas and Florida. Consciousness is an important theme in his work. Philosophically, he contends that it is possible for human beings to foster a conscious relationship with spiritual forces - forces that evade our physical perceptions. Through his own creative processes, he seeks to demonstrate this possibility. Nicholas Criscitelli was born in Springfield, MA. in 1979. He received his BFA from the University of Central Florida in 2011. He has exhibited at the Orlando Museum of Art, UCF gallery, Godspeed Gallery, KMDG studios, and Current Art Gallery. He currently lives and works in Sanford, FL with his fiancé and black and white cat. I’m attending a paint party, what should I wear? We will provide an apron to help protect your clothing, but come dressed to paint! Errant spills and splatters do happen! All the supplies needed for the class are provided, including an apron, brushes, canvas, easel, etc. What time should I arrive for a paint party? Be sure to arrive on time, as the class will begin promptly at the starting time. Can I paint something different than the class I signed up for? Absolutely! We ask only that you keep your painting appropriate for the ages attending your class. What are the date night paint parties like? No kids allowed! Date Nights are for older teens and adults only. The designs are created for two canvases, so you must have a painting partner. We create our Date Night designs to be aesthetically pleasing when hung together or separate. So you can attend with a friend or a date. No, we do not serve wine at any of our paint parties. Are the paint parties family friendly? Yes, all the paint parties have family-friendly designs, which you can confidently hang in any family environment. We often partner with family-friendly locations like day-cares, churches, and coffee-shops. What makes your paint classes different? Our instructors are real-world artists with experience in painting. Each design features specific techniques and skills employed by professional artists. We have a particular focus in creating quality content, in terms of composition, color, balance, etc. We strive to have designs you would be happy to have hanging in your house. We also seek to create an environment in which all feel comfortable. You will not find coarse language at a Knoe Studios Paint Party. I want a Knoe Studios paint party at my business, what should I do? Please contact us at emily@knoestudios.com for our availability! We love to partner with local businesses like cafes and coffee shops for paint parties. Is Knoe Studios a non-profit? No, we are not a non-profit. We enjoy working with non-profits and churches to help raise funds for good causes, but we are a for-profit business. What causes does Knoe Studios support? We are happy to work with many kinds of Christian churches and many denominations. We support Missions work and many other good causes.